I have been thinking about the real-time example of stack data structure and found this question on StackOverflow. 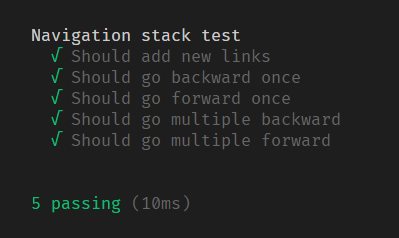 I have two stacks Forward Stack, Backward Stack and one variable to hold current state. When user visit URL Second time pushes the current URL into Backward State. If User visits URL for the First time then Add it to CurrentURL, If second URL comes in then push the current URL into Backward Stack and replace the Current URL. On clicking Backward button push current URL into Forward Stack and pop the last URL From Backward Stack and make it as currentURL and If the stack is empty then just return. On clicking Forward button push current URL into Backward Stack and pop the last URL From Forward Stack and make it as currentURL and If the stack is empty then just return. I wrote a test case also for this. Here is Github Repo for full source code. this is my first story, I love to hear your feedback and do not forget to correct me if I am wrong anywhere.